...but they should be. Unfortunately, for the past century various organizations have been campaigning to keep children off streets in the name of "safety." 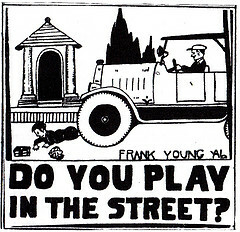 Bike Delaware has posted some interesting images, like this one, from early efforts to keep kids from playing in the streets--because those streets belong to vehicles, not people, right? Sadly, children seem to have learned the lesson. Want a sign of how important private vehicle travel is to our culture? According to one recent study, of the 25 words every normal toddler should know before age two, only one has to do with transportation: "car." What is the argument that kids should play in the street? Isn't "safety" a legitimate reason to not play in the street? The idea is that some streets should be available and safe for all users, not just one type (e.g. cars), as the purpose of those streets is not primarily to move vehicles. This is not to say that vehicle movement (meaning the movement of private vehicles, as well as transit and freight vehicles) isn't an important part of what roads do--it's just not the primary purpose of every road. So you'll see in some places (primarily outside the US) street systems where the center of the road is for high speed vehicle movement, and along the sides (sometimes separated by a sidewalk) is a frontage road that serves the needs of slow-moving vehicles and pedestrians, all within on shared roadbed. Here in the US, I suggest that local residential roads--and perhaps some main streets in commercial distracts--should be designed similarly to permit only very slow-moving vehicle traffic, thus creating space that is safe for pedestrians and other vulnerable users. But, that's not going to happen as long as we continue to view local roadways as places primarily for vehicles, and not as legitmate playgrounds for kids.